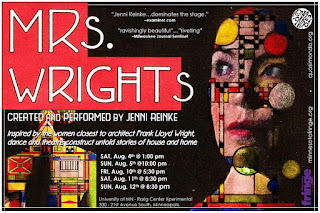 Frank Lloyd Wright apparently went through three wives and a mistress in between before his life was over. Only one of them outlived him. The implication here is that he didn’t treat them very well. But though we do get a brief interlude of Mr. Wright himself in the proceedings, he is in mourning for one of his past loves. Each of the women gets to take the stage alone. All of these people are embodied by Reinke in a really impressive show of character work, distinguishing each from the other in movement, as well as music and costume. Our primary narrator who opens and closes the show is the third Mrs. Wright, his widow - and the woman who keeps his name alive and defends and preserves his buildings after his death, to ensure that his reputation outlives him. Frank Lloyd Wright, it seems, owes Olgivanna (Lazovich Miljanov) Lloyd Wright quite a debt. We are also introduced to Wright’s mother, Anna Lloyd Jones - the sound effect of a leaky roof perhaps inspiring the child to build better homes for the ones he cares about to live in. That doesn’t seem to have applied to his first wife Catherine Lee Tobin, a socialite and social worker, whose dance implies that she was largely left alone to fend for herself, raising their six children and wrangling with her mother-in-law. Wright’s mistress, Mamah Bouton Borthwik, a translator of feminist works, enjoys a playful dance with a trenchcoat representing Mr. Wright being flirty and naughty at a picnic. But the sound effect of a house fire implies she doesn’t meet a very happy end. After Wright’s mourning dance, around a set of clothes laid out on the floor to represent the departed, mirroring an opening dance around his own clothes by his widow, Wright’s second wife appears, Maude Miriam Noel, a sculptor, and a nurturing presence who brings him back into the world of the living. In a final nod to all who have come and gone before her, the widow Wright pulls a coat rack around the space after her, dropping the clothes of the other characters as it goes. It’s a fitting image around Mrs. Wright’s final dance for us. Ms. Reinke’s choreography and performance are so effective, my only advice would be to lean harder on those and let the other details go. There were a couple of points in the middle of the piece were extended sound cues were trying to give us headlines or other details of the lives of Wright and the women who loved him. Maybe it’s because I was processing most of the story visually or through performance, but I found the scripted sound cues in the third person a lot harder to take in. And my lack of that knowledge didn’t impact my understanding or appreciation of what came after. So, as juicy as some of those details might have been, I found myself more interested in the women in front of me, and less in their context for others. And I think that’s the point the whole production is driving at anyway. Behind every famous man, there’s not just one woman, but several. 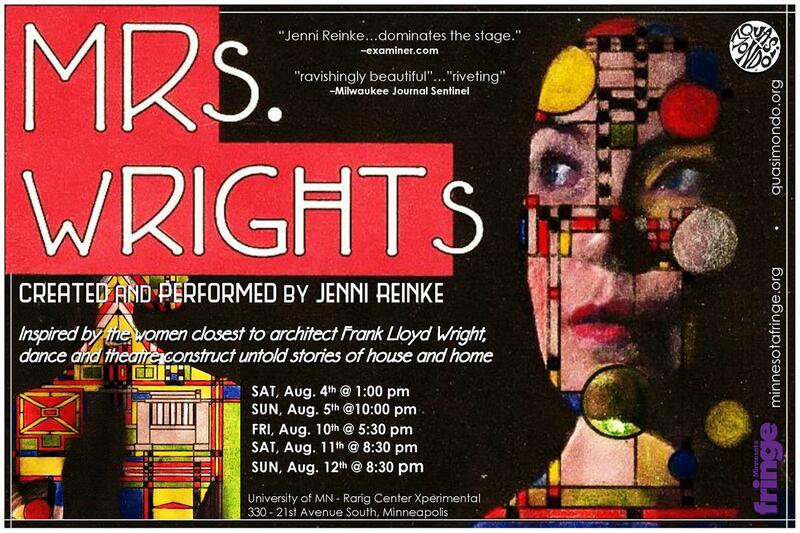 In Mrs. Wrights, thanks to the artistry of Jenni Reinke, we get to meet them.